Much like Aluminum, which can be manufactured into Anodic Aluminum Oxide (AAO), Titanium metal can be also electrochemically oxidized (or anodized) to form an ordered array of parallel nanotubes. The resulting nanotubular Anodic Titanium Oxide (ATO) materials are often referred to as Titania Nano Tubes (TNTs), or sometimes as TiO2 NTs. 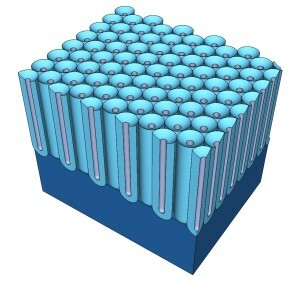 The name reflects the distinct structure of ATO, which typically appears as close-packed arrays of distinctly separate nanotubes (unlike AAO, where pores form hexagonal close-packed geometry without any gaps between individual cells). Improvement in the understanding and development of titanium anodizing process (electrolyte composition, pretreatment of metal, anodizing potential, etc. ), which has led to higher quality ATO materials. 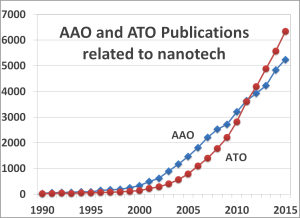 Exploration of the growing variety of applications for ATO, leveraging its fascinating and unique properties (optical, mechanical, thermal, biocompatibility, etc. ).